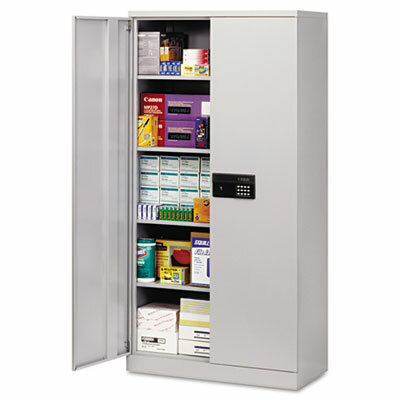 Keyless electronic coded lock records access and includes power loss backup features. Requires 4 AA batteries (sold separately). Four heavy-duty shelves adjust on 1 3/4" centers and are reinforced with welded stiffeners. Doors open 225° on concealed hinges. Industrial-grade steel with a durable powder coat finish. Easy-to-assemble, snap-together design. Doors open 225°.Keyless electronic coded lock records access and includes power loss backup features; requires 4 AA batteries (sold separately). Four heavy-duty shelves adjust on 1 3/4" centers and are reinforced with welded stiffeners.